Contains non-ani mal / non-human derived hyaluronan. 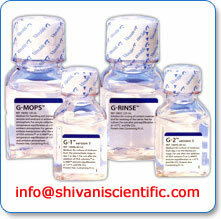 human albumin (G-MMTM) provides a completely defined formulation indispensable for consistent good success rate. Based on the latest scientific findings regarding the physiologic needs of human embryos. Common set of ions and amino acids to prevent intracellular stress induced by moving embryos through many different types of solution. Reduced risk of ammonium ion accumulation. Increased safety and consistency through Recombinant Human Albumin available for use in all products. Hyaluronan added to promote embryo development, implantation and increase cryosurvivability. Increased treatment efficacy for both fresh and cryopreserved embryo transfer.